Last Saturday was a bad day for North West clubs in the Irish Junior Cup with all three bowing out. The fourth representative Foyle Wanderers game was called off against Tollymore Swifts and will now be played this Saturday. BBOB had high hopes going into their game with Ballysillan YM at Lisnagelvin but they lost 3-2 with McCready and Moore getting their goals. Churchill, who have had a great run in this competition, went out 3-2 on penalties against visitors Raceview after the sides finished level on 2-2, Hawthorne and Smallwoods were on target for United. Drummond travelled to Belfast to take on a very good Lower Shankill side and were beaten 2-0. In the Premier Division the Waterside derby between Lincoln Courts and Caw finished 1-1 with King scoring for the Courts and Harris for Caw. Tullyally Colts moved into fifth in the table after a 3-0 win at Irish Street with goals from Kayne, Cooke and McFaul. 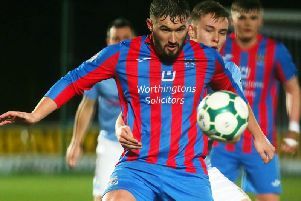 Four games are down for decision this Saturday in the Premier Division as well as Foyle Wanderers’ Irish Junior cup tie. United, who are currently looking for a new manager after Glenn Wallace was appointed head of youth development, have moved off the bottom of the table but they have along way to go if they are to avoid the drop. They had a good win last time out although they had a few first team players involved. Ardmore were without a game last week as their cup final with Claudy Rovers was postponed. They are now fourth from bottom - not where they expect to be but they should win this one. The match of the day, Both sides are in the title mix as Rovers have two games in hand over leaders Drummond and can draw level if they win both. They didn’t play last week and will be anxious to get a game this Saturday. The Old Boys were disappointed to lose in the Irish Junior cup where their usually steady back four conceded three. They can’t afford another slip up, this could end all square. Third from bottom against bottom in this tie, the Courts got a deserved point last Saturday and they will be favourites to collect all three from this game, they badly need a win. Mark McKittrick is soldering on which is a credit to him and his back room staff. With only one win all season their confidence has been blown away and another defeat looks on the cards. This is the kind of game which Tullyally love as the better the opposition the better they seem to play. They have proved that against the top sides this season. Their prolific goal machine Andy Cooke was on the scoresheet again last week. Drummond put up a decent show against Lower Shankill in last weekend’s defeat and they will want to bounce back straight away. Geoff Ferris will have his players up for this one, but they will need to be at their best.